I left Palm Springs, where the streets are named after stars, and drove east to Phoenix. In some stretches, sandstorms raged on both sides of the road. I passed Desert Center, the birthplace of Kaiser Permanente and the site of General Patton’s Army Air Field training center. Now, it’s only a few souls short of a ghost town. Sped past Quartzsite, a quasi-city of tens of thousands of RVs. Ten major gem shows and fifteen huge flea markets attract over 1.5 million swappers annually, mostly during January and February. Over three-thousand dealers of rocks, minerals, fossils and jewelry set up shop. Quartzsite is also the site of Joanne’s Gum Museum with its collection of wrappers from around the world. In Phoenix I gathered Craig, my college roommate of three years, from the airport. He agreed to join me for a few days during my tour of the Arizona borderlands. A vacation for him and rare company for me. Time to catch up, embellish old stories and write some new ones. We headed south and soon were surrounded by sand, scrub, mountains and little else. The desert road followed railroad tracks into Gila Bend, home of the Gila Bend High School Monsters. We continued to Ajo. The town’s name comes from au’auho, a Native-American term for red pigment. Pathetically, we found its pronunciation, AH-ho, endlessly amusing. A couple of ajos in Ajo. Native Americans had long mined Ajo for pigment. In the 1700s the Spanish mined for copper. In the mid-1800s, the town boomed. Phelps Dodge, the nation’s largest copper company, bought the mine in 1931. At one time New Cornelia was the third largest copper mine in the United States, producing over six-billion tons of ore, worth about $21 billion. The mine closed in 1985 and the town’s population dwindled. A coyote greeted us when we pulled in. 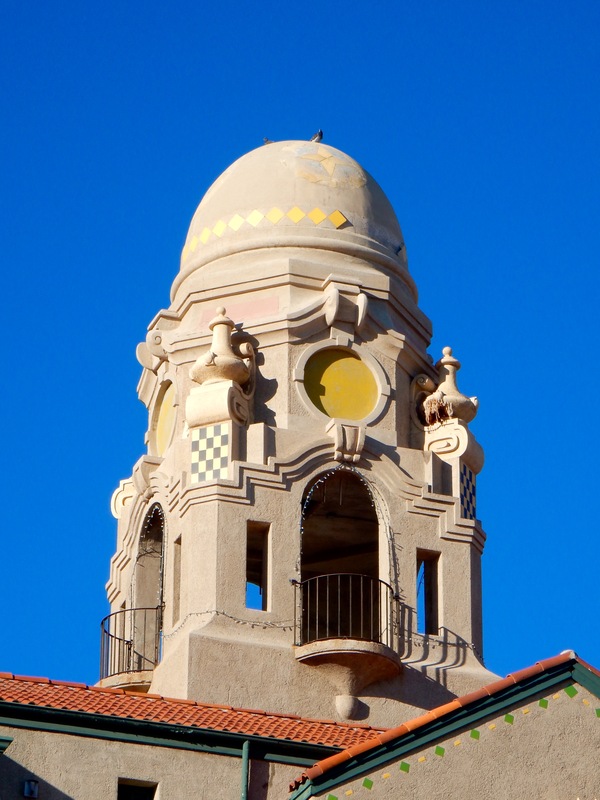 Still, the downtown plaza, surrounded by the old railroad depot, an arcade and a couple of churches, is elegant, dressed in Spanish-colonial-revival architecture, a style with Moorish influences. We visited the mine, an enormous circular pit, 1-1/2 miles across. The crater is over one-thousand-feet deep. The road which spirals around the sides from top to bottom is over three-hundred-miles long. The steep shortcut road, which jumps the switchbacks, is still over twenty miles to the bottom. An old-timer, an 80-something-year-old tour guide who used to work at the mine, shared its proud history with us from his perch on the edge of the rim. He and Craig agreed to split the proceeds from any gold either of them found. Further south, we drove into the town of Why, which required posing for photos next to its sign. Why got its name from the Y-shaped intersection of routes 85 and 86. One of its few shops is called Why Not? 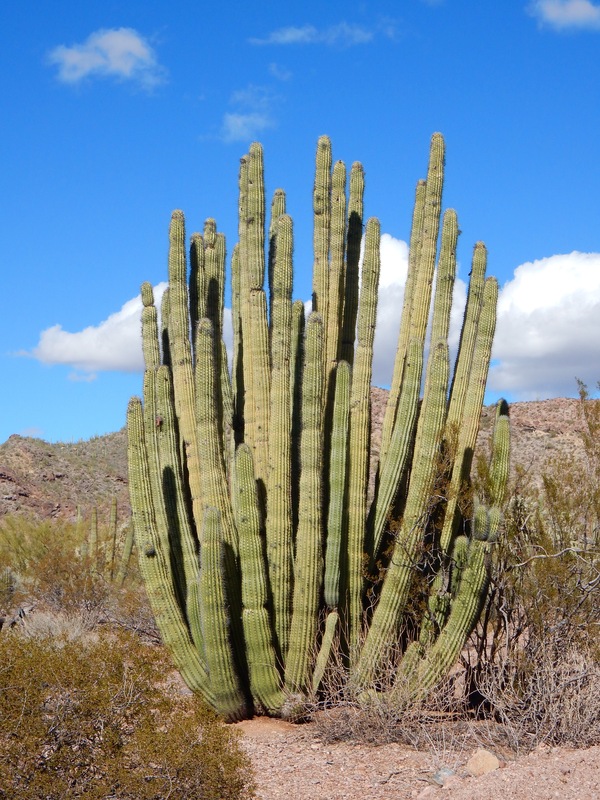 We entered Organ Pipe Cactus National Monument, the only place in the United States where organpipe cacti grow wild. 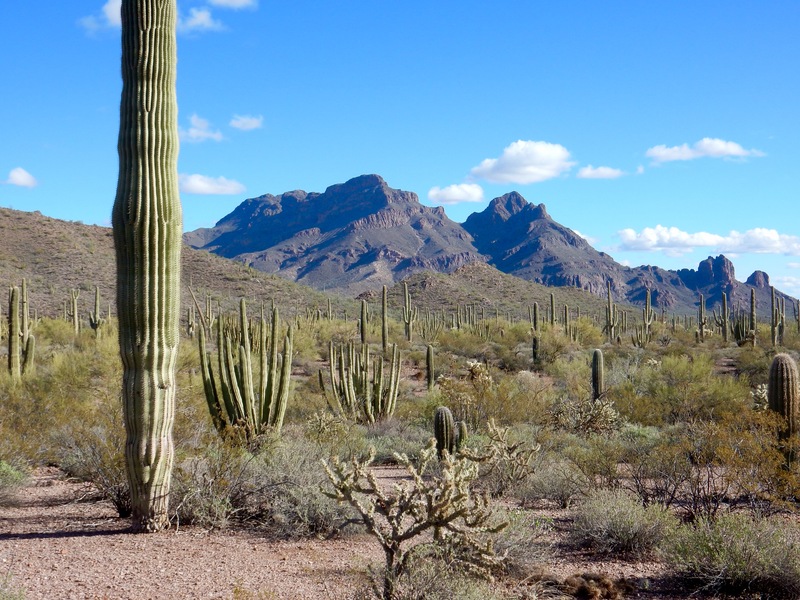 The park is within the 100,000-square-mile Sonoran Desert, which overlaps parts of Arizona, California and Mexico. For thousands of years, native North Americans and wildlife have drifted back and forth across what is now a thirty-one-mile border with Mexico. The boundary was first established with the Gadsden Purchase in 1853 and marked with stone obelisks. Eventually barbed-wire was used to protect the park. In 2006 the National Park Service completed construction of a steel fence, intended to stop vehicles from entering the United States illegally. Animals and people on foot, however, can still get through. The visitor center offers educational talks, including one by the Border Patrol and another by Humane Borders, each explaining their separate missions. Humane Borders, a non-profit, maintains a system of emergency water stations in the Sonoran Desert for migrants making the journey on foot. Its mission is to save people from dying of dehydration and exposure in the desert. The water stations are located with permission and the Border Patrol has agreed not to target them. We drove the twenty-one-mile gravel-road loop around the Diablo Mountains, stopping numerous times to admire the rocky mountains and the cacti. 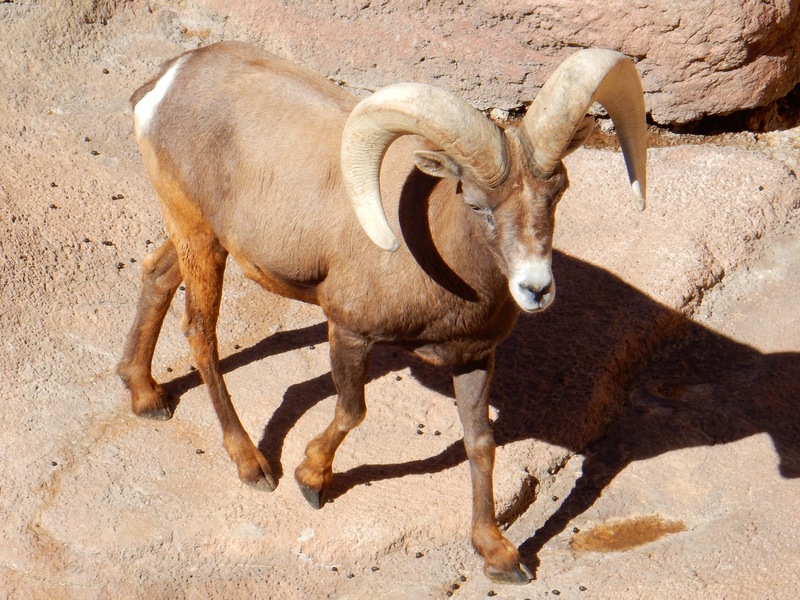 Coyotes, bighorn sheep, javelinas, Gila monsters, tortoises, roadrunners, lizards, snakes, elf owls, kangaroo rats and jackrabbits all live in the hot, dry environment. We saw none of them, but we did see a forest of organpipe. 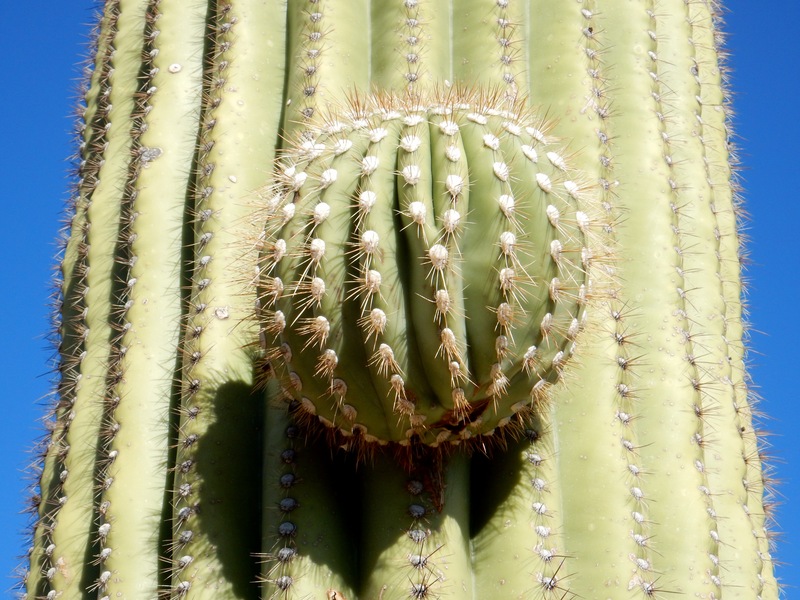 The cactus’s branches grow straight up from a short ground-level trunk. We also saw numerous patrol vehicles in the area so, out of curiosity, we drove the few extra miles to the border. Lukeville is the crossing point into Sonoyta, Mexico. Nothing there but a seedy hotel, a gas station, a few places to buy Mexican auto insurance, a bus terminal and a gate. We checked into the Guest House Inn, built in 1925 by Phelps Dodge to accommodate visiting mine officials. After Cornelia closed, the house was abandoned until 1988 when it was renovated as a B&B. 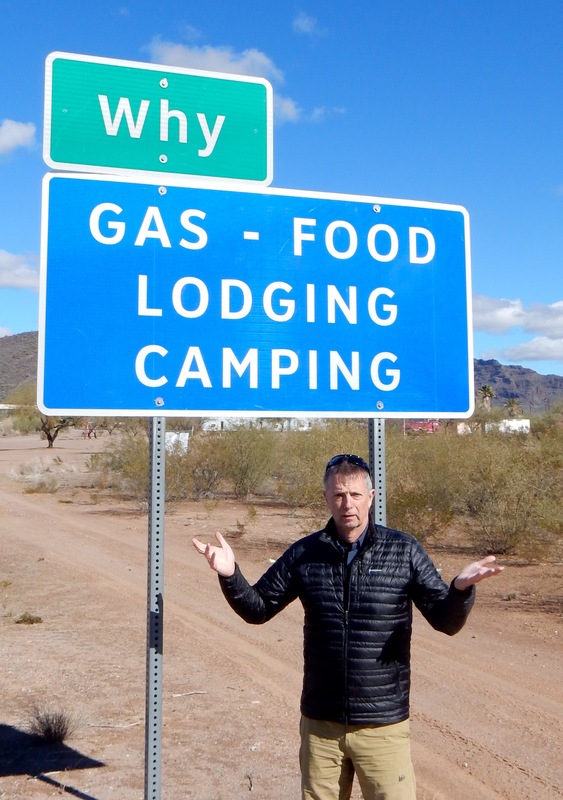 We asked the manager about restaurant options in Ajo. He reviewed all three of them for us. No moon. After dinner, we drove into the desert for a dark-sky look. Astounding. I’ve never seen the Milky Way so well-defined and dense with stars. We watched shooting stars, satellites and fighter jets playing tag. Next morning, we left Ajo and turned east through the Tohono O’odham (THO-ho-no AH-ah-tum) Nation toward Tucson. The first stretch was desolate, vast plains of dirt alternating with vast plains of gravel, mountains in the distance. I spotted a roadrunner and Craig a coyote. 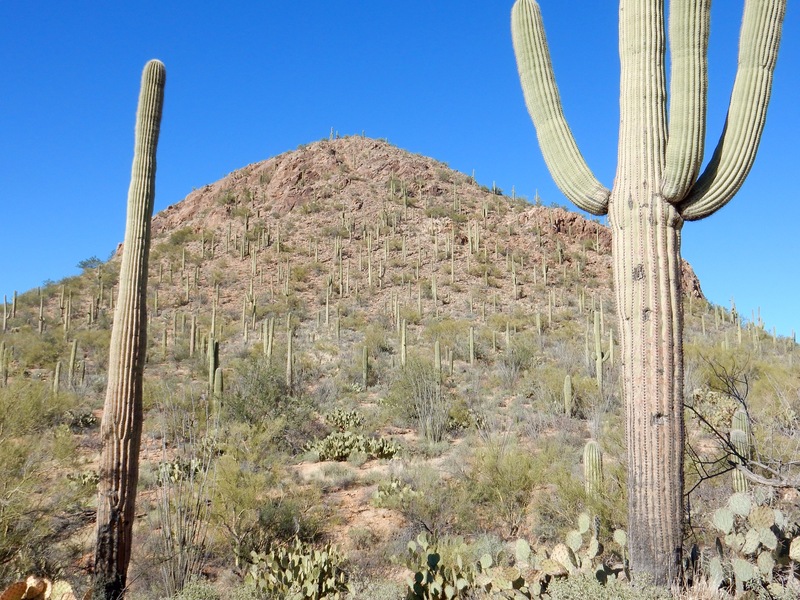 We headed into the hills and the scenery soon bristled with saguaro cacti, like three-day beard stubble. 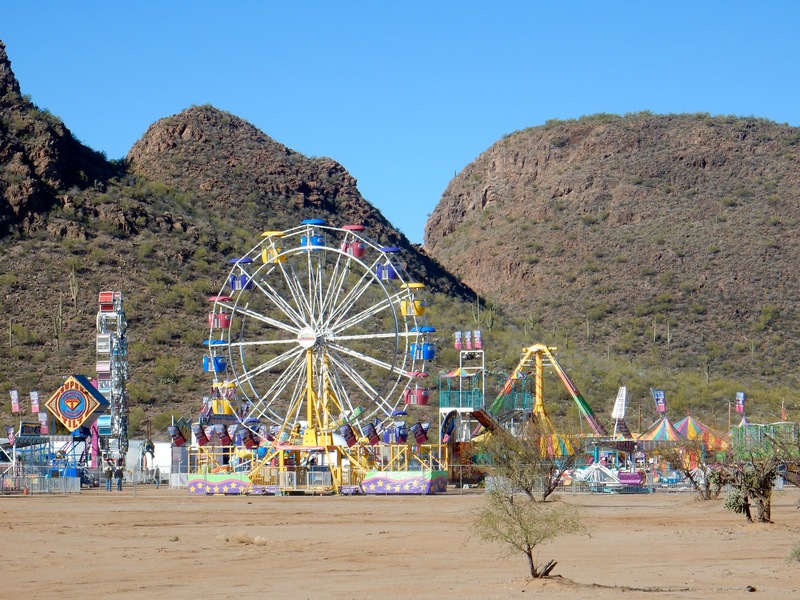 An empty carnival was set up on tribal land next to some rocky outcroppings. 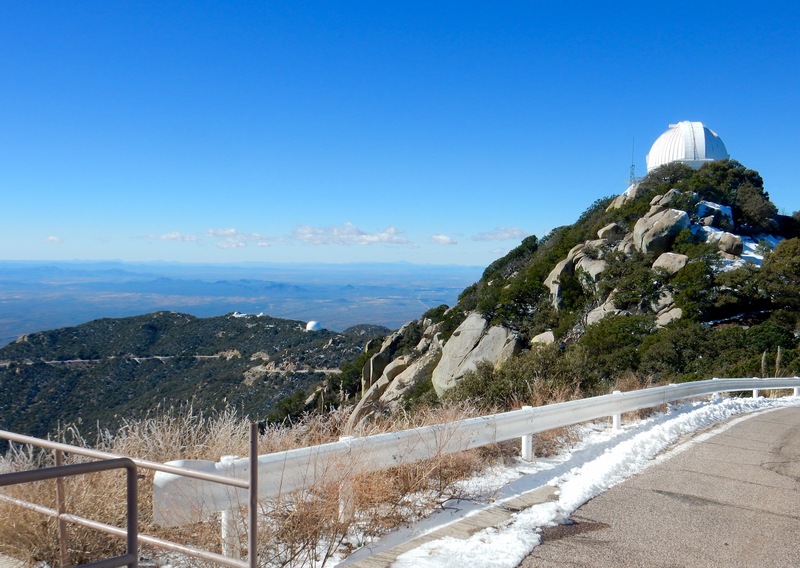 For twelve miles, we climbed the steep switchbacked incline to the Kitt Peak National Observatory, arriving in time for the morning astronomy tour. Snow on top at nearly seven-thousand feet. 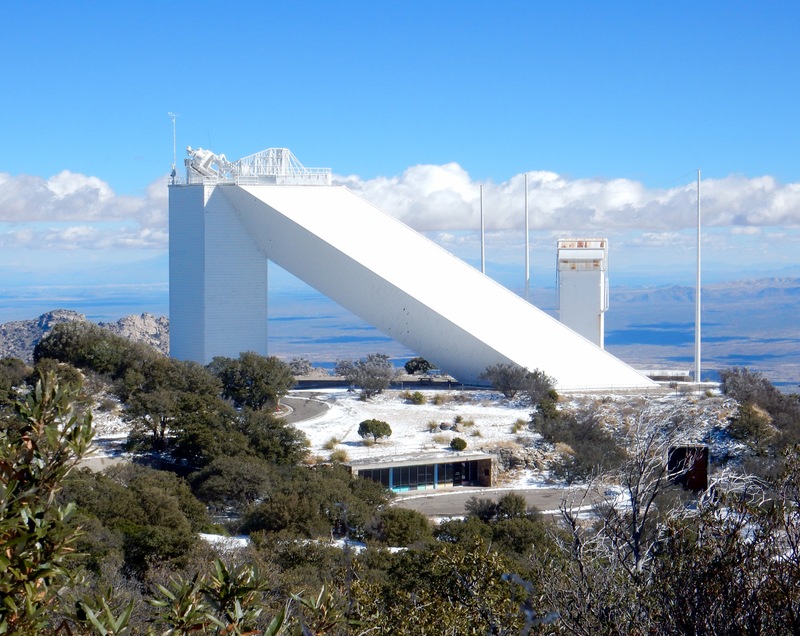 Kitt Peak was the first national observatory in the United States. It has the world’s largest and most diverse collection of telescopes, twenty-five optical and two radio, representing eight research organizations. Kitt is used by over five-hundred visiting astronomers for research each year. 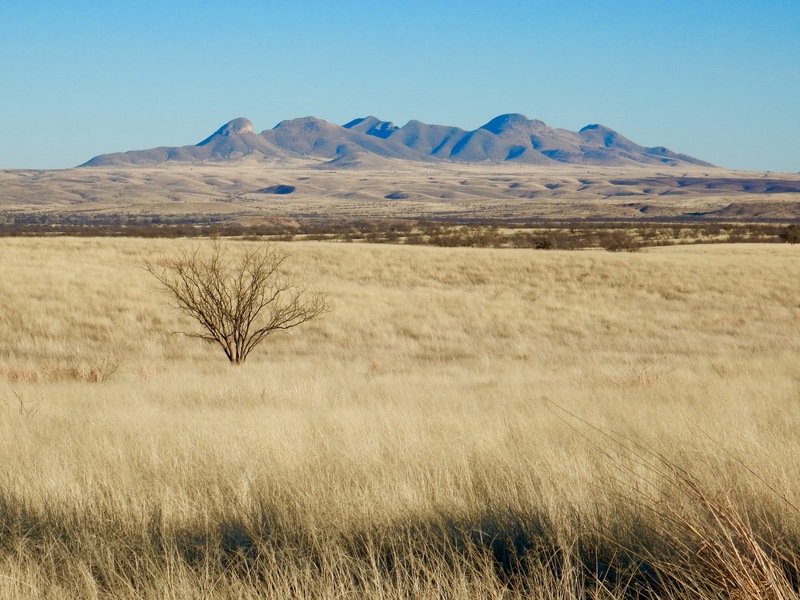 The observatory leases its land from the Tohono O’odham under a perpetual agreement. We passed the dorms of sleeping astronomers, marked with signs asking for silence. After an introductory talk about astronomy, telescopes and the contributions of Galileo and Newton, we went inside one of the telescopes, the 2.1-meter, for a close-up look. It is controlled remotely from Cal Tech in Pasadena. Another prominent telescope on the peak is the McMath-Pierce, the largest solar telescope in the world. Some of astronomer Vera Rubin’s space-breaking research was conducted at Kitt Peak. She is given credit for discovering dark matter (while simultaneously dealing with gender bias). Here goes: Scientists can’t see dark matter, as it neither reflects light nor gives off energy. Instead, they infer its existence because of its gravitational pull on mass they can see. Incredibly, dark matter, scientists believe, makes up ninety percent of the mass of the universe. As a result, Rubin proved that what astronomers used to think was the universe is just the tip of the iceberg. The view from the top of Mount Kitt is astounding, as it should be, 360 degrees across endless basins to distant mountain ranges. “Millions of miles,” she said, without missing a beat. 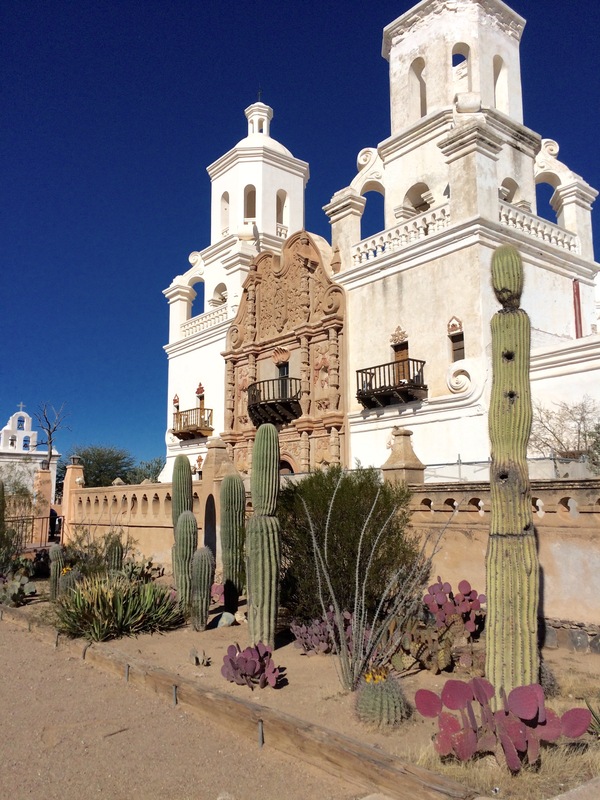 Next day, we drove south of Tucson to Mission San Xavier del Bac, a gleaming white edifice in the desert. Founded in 1692 by Jesuit missionary Padre Eusebio Kino, the mission is one of a chain of thirty he established in the region. The current building was begun in 1783. Inside San Xavier’s massive, carved wooden doors are colorful paintings, frescoes and statues, both Spanish and Native American in style. The mission is considered the finest example of Mexican baroque (a strand of Spanish colonial) architecture in the United States. 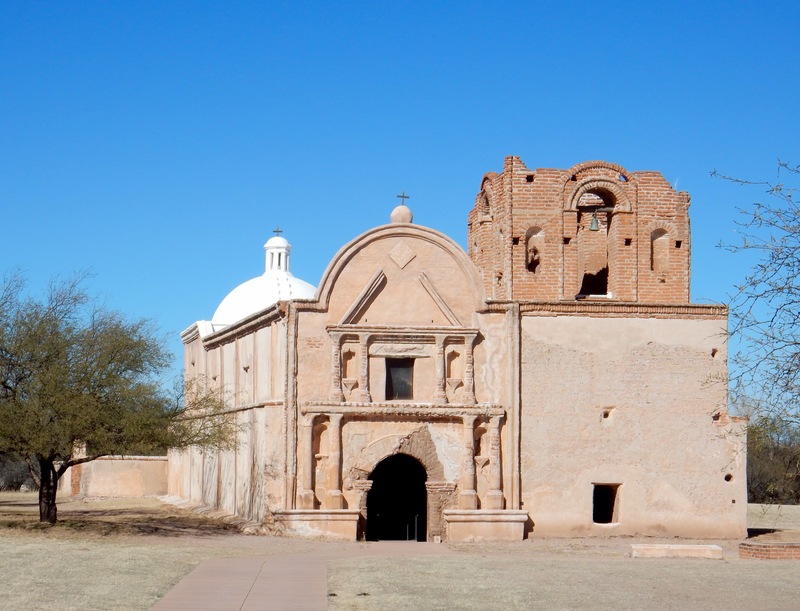 For the Tohono O’odham, San Xavier is still a working mission. Craig and I took the tour, then bought frybread from the locals in the parking lot. We continued south to the artists’ colony of Tubac. Tubac, located on the Santa Cruz River, was the first Spanish colonial fort in what is now Arizona. Established in 1752, the village was one of the stops on El Camino Real (the Royal Road) from Mexico to the Spanish settlements in California. The remains of what is left of the old Spanish fort are preserved within the Tubac Presidio State Historic Park. In 1775 a group of settlers left Tubac and established a mission in California. Today, it is known as San Francisco. We continued to Tumacácori National Historical Park, which protects the ruins of three Spanish colonial missions. The only one open to the public is San José de Tumacácori, established in 1691. The Jesuit blackrobes and the Franciscan grayrobes sustained the mission until 1848, when it fell into disrepair. Restoration efforts began in 1908 when the site was declared a national monument by President Theodore Roosevelt. We were guided through the mission grounds, including the church, graveyard and orchard by a ranger. She raised an issue about restoration, questioning whether repaired historic structures are authentic. If different components of the Alamo, for example, are patched repeatedly, at what point is it no longer the Alamo? The metaphor is an example of Theseus’s paradox. There are versions of this paradox from around the world, including one about Abe Lincoln’s restored axe. Again, we decided to visit the border, just a few miles away. 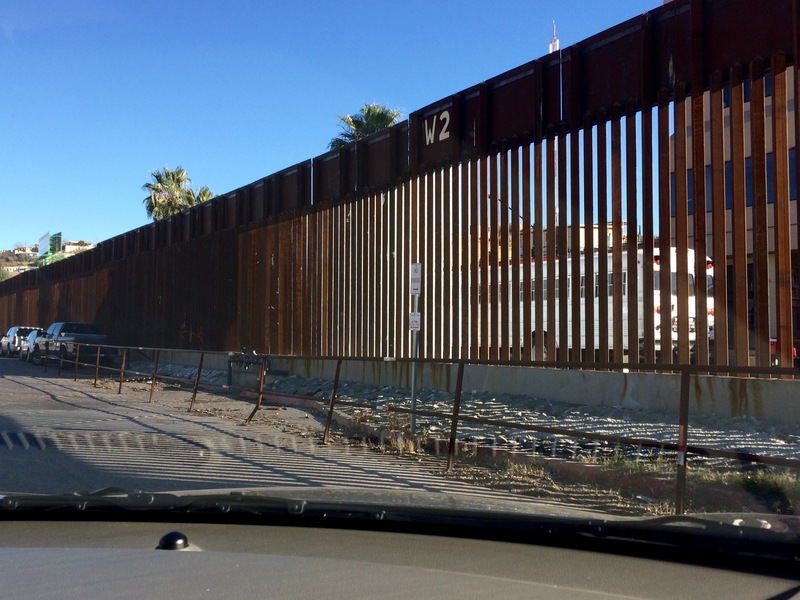 In Nogales, we saw the wall, an ominous-looking monster zigzagging up the hills. In the center of town, the wall is composed of metal louvers, allowing people to meet, talk and perhaps pass goods between the vertical slats. Border-Patrol agents supposedly like the openings, as it allows them to watch what is happening on the other side. On the way back to Tucson, we took the back roads through Patagonia and Sonoita, a high range of golden grass dotted with mesquite. At a remote patrol checkpoint, we were waved through. In Tucson, we passed the Boneyard, rows and rows of surplus planes, thousands of them, parked permanently on the tarmac. 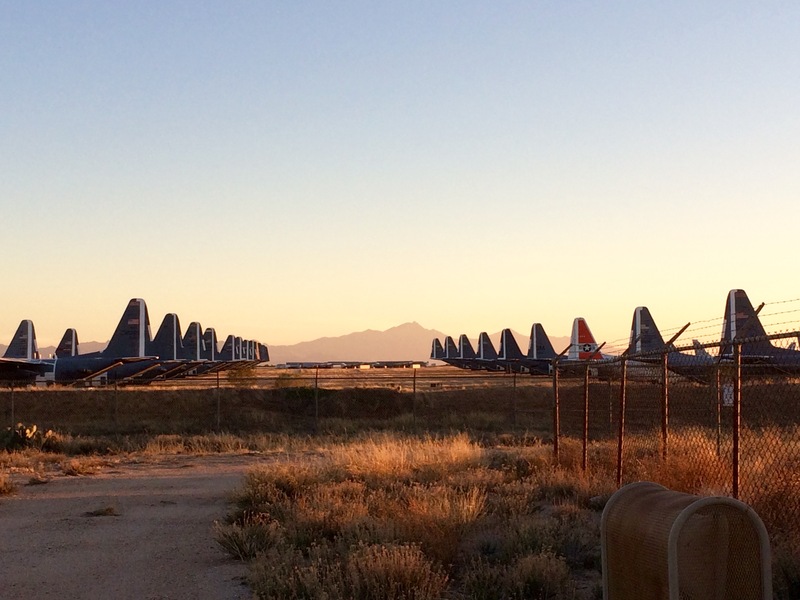 Davis-Monthan Air Force Base is the largest aircraft boneyard in the world. More than forty-four-hundred leftovers from the Air Force, Navy, Marine Corps, Coast Guard and NASA are in its inventory. Craig’s last day. We decided to drive to the summit of Mount Lemmon, contained within the Coronado National Forest. 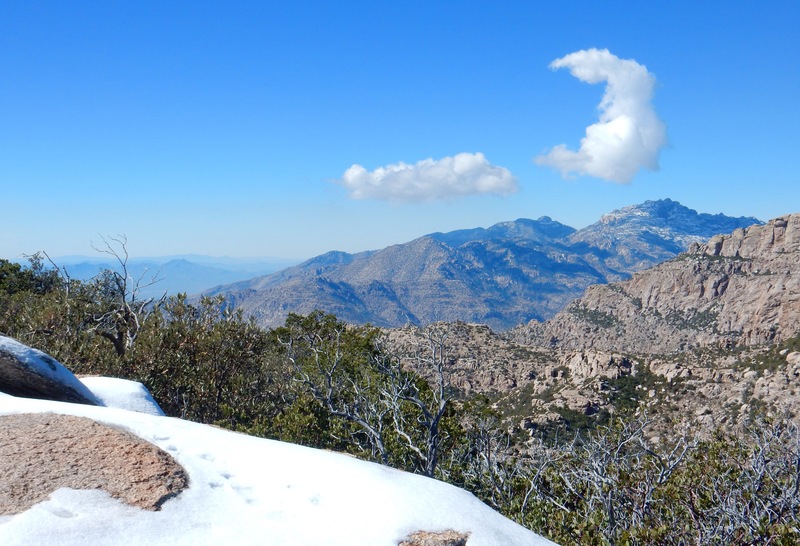 At 9,159 feet, Mount Lemmon is the highest point in the Santa Catalina Mountains. The road to the top, called the Sky Island Scenic Byway, climbs six-thousand feet in twenty-seven miles. It is a favorite training ride for cyclists. As the route’s elevation changed, so did its ecosystems, equivalent to a journey from Mexico to Canada in a couple of hours. At the bottom, saguaro cactus. At the top, fir and aspen. Near the summit, loaders and graders were clearing the road. We took a break at Mount Lemmon Ski Valley, which receives two-hundred inches of snow annually. On to the airport. After Craig checked in for his flight, I was back to talking to myself and laughing at my own jokes. While growing up in the 1950s and 1960s, I was a fan of TV westerns: The Adventures of Kit Carson, Bat Masterson, The Life And Legend Of Wyatt Earp and dozens of others. At the time, the stories seemed like ancient history but, in reality, they unfolded fairly recently. Most of the colorful characters portrayed in movies and TV shows were alive and kicking just a hundred years ago. The history museums in the Southwest are full of their artifacts, which never fails to surprise me. Wyatt Earp’s pistol, Kit Carson’s rifle, Billy the Kid’s spurs. Exhibits at the Arizona History Museum focus on two of the West’s most legendary provocateurs, Pancho Villa and Geronimo. The Mexican Revolution, which began in 1910, ended a dictatorship and established a republic. One of the movement’s most prominent leaders was Pancho Villa. When his forays into border towns aroused the ire of the United States, the army was sent to capture him, an effort that ended when World War I began. After the revolution, Villa agreed to a truce with the Mexican government. In 1923 he was assassinated. Villa understood the value of promotion. He helped build his own brand, providing interviews to journalists, posing for photos and starring as himself in Hollywood films. Another guerrilla leader, Geronimo, waged war in the Southwest for over thirty years. His revenge raids against American and Mexican settlements were in retaliation for the colonization of traditional Apache lands. In 1886, after a vigorous pursuit in Mexico by the US Army, Geronimo surrendered. He was exiled to faraway Florida to keep him from stirring up any further trouble. In his old age, though still a prisoner, Geronimo was a celebrity. He appeared at fairs, where he sold souvenirs and photographs of himself. He was never allowed to return to the land of his birth and died a prisoner of war. His rifle and field glasses are on display at the museum. Over dinner at Reilly Craft Pizza in downtown Tucson, I took the opportunity to ask an Arizonian, with delicacy, about the proposed wall. Before there was a border, Native North Americans, who today might be called Native-Americans, Mexican-Americans and Mexicans, moved back and forth freely through the area for thousands of years for religious, cultural, social and economic reasons. The Tohono O’odham Nation, for example, determines tribal membership based on ancestry not citizenship. A family member born and living in Mexico is still a member of the tribe and is recognized by the United States as a citizen. Ranchers with land adjoining the border would likely prefer more protection from the migrants moving through their property. Environmentalists are concerned about how the wall will impact migrating wildlife. The economies of the southwestern states are dependent upon the availability of cheap labor provided by undocumented migrants. The Gem, Mineral & Fossil Showcase has invaded Tucson. One of its forty-four shows, the American Indian Exhibition, was setting up shop in the hotel as I went to breakfast. I went instead to the Arizona-Sonora Desert Museum which, despite its name, is a zoo and botanical garden. A walking path loops through twenty-one acres of park, passing the natural enclosures of 230 animal species. I saw all of the animals I didn’t see in the desert. (In fairness, they mostly come out at night and I don’t.) 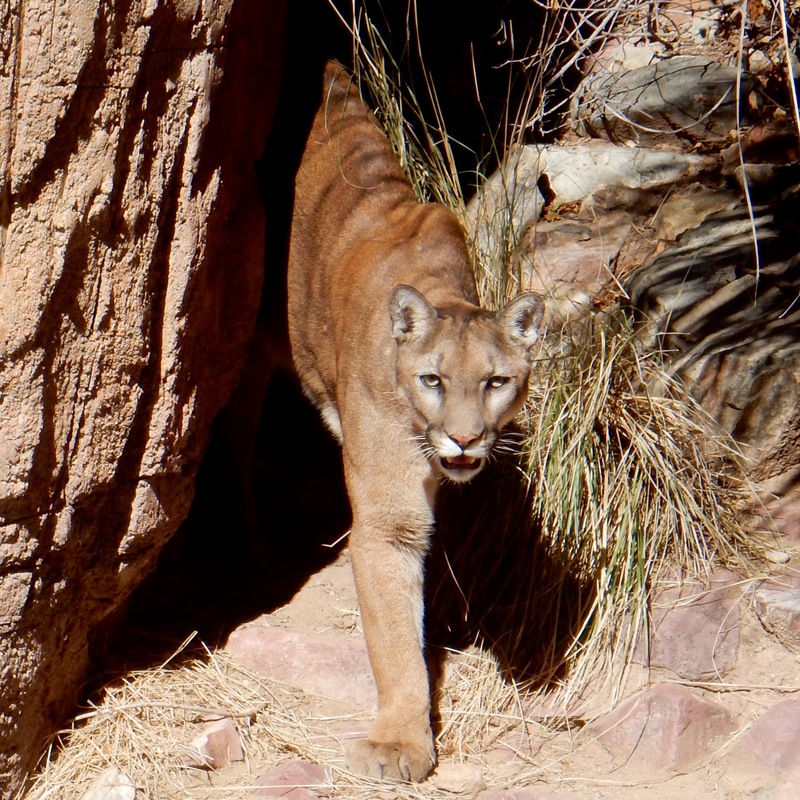 A mountain lion, a Mexican wolf, bighorn sheep, javelinas, rattlesnakes and a Gila monster, all safely corralled in their compounds. The prairie dogs, I must say, seemed quite happy in theirs and posed for photos. 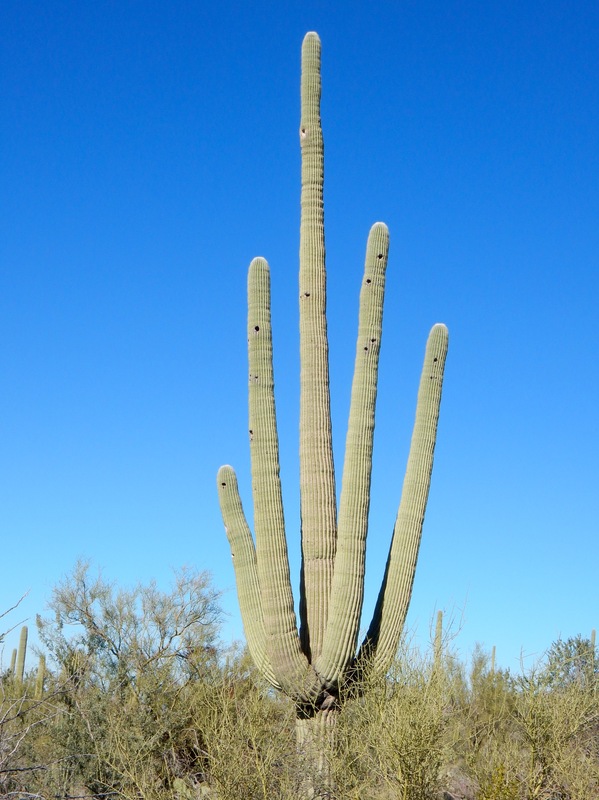 Saguaro cacti grow slowly, taking about fifteen years to reach one foot in height, fifty years to reach seven and almost a century before they begin to grow their arms. They can live up to 200-years old. 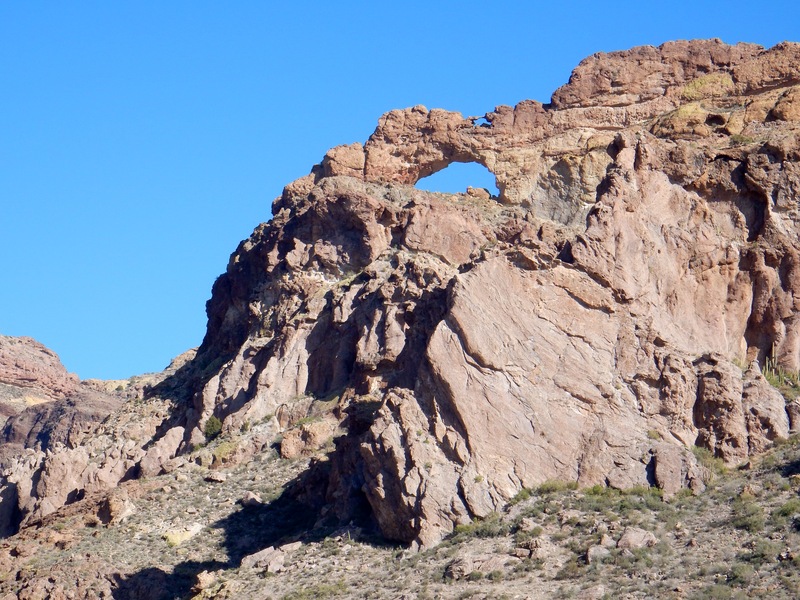 I drove the single-lane, dirt Bajada Loop Drive, stopping at Signal Hill for the short hike to the petroglyphs. 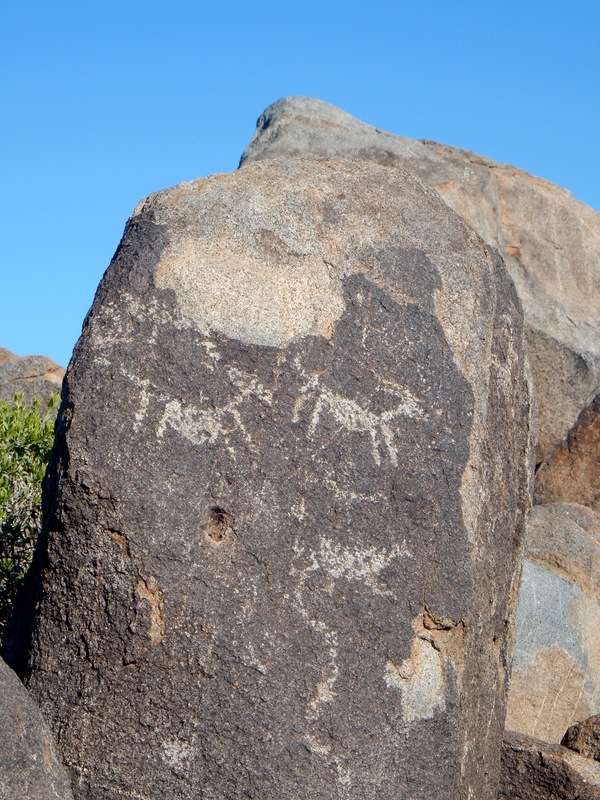 The rock art was made by the Hohokam, an ancient people who lived in the area between 450 and 1450 CE. The images included humans, animals and abstract designs, such as spirals. Dinner in downtown Tucson at the historic Hotel Congress, site of an event that led to the capture of gangster John Dillinger in 1934. After a series of bank robberies, members of Dillinger’s gang moved into the hotel under aliases. One night, a fire broke out. Firefighters swept through the building, ushering the guests to safety. Oddly, a guest on the top floor seemed more concerned about his luggage than himself. He was hesitant to leave the building and, once outside, persuaded firefighters to reenter the burning hotel and retrieve several of his bags. Their suspicions aroused, local authorities figured out the identities of the gang members. (The bags contained $24,000 and numerous firearms.) A stakeout resulted in the easy capture of Dillinger without the firing of a single shot. Goodness! Border walls, dark matter, Dillenger and amazing photos all in one post. Thanks for sharing!